Multi Sifter | KANTO KONGOKI INDUSTRIAL CO.,LTD. andtransferring can be fully automated. 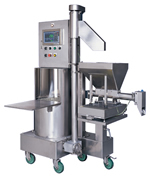 With our KDM series mixer, flours can be added automatically in making sponge dough while the original system produces no lumps in the flour during mixing.